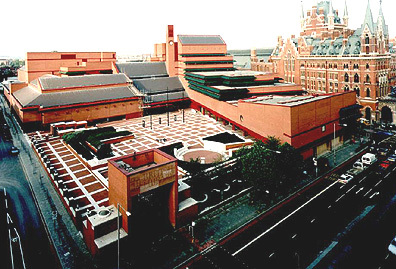 The magnificent British Library building has a Welsh slate roof from Penrhyn Quarry. The area over the entrance is made up of three panels of slates sizes 20x12, 18x10 and 16x8 inches designed to emphasise the receeding perspective. 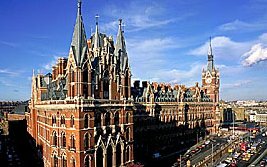 Next door is the Gothic St Pancras Station. Originally roofed with green Swithland slate from Groby Park in Leicestershire in the early C19, it was recently re-roofed using Burlington Ellterwater Green slates to make up the shortfall.